Howdeeho! It's your boy, Moxvallix, signing in! Super Toby has just come back from an epic sized break and jumped straight back into the storyline. Wow, I have not posted to this blog in a while. I recently redesigned the website, hopefully making it more mobile friendly. Well, thats all for now. Thats right, it's me, Moxvallix. Actually, that's pretty obvious, because I am the only author of this comic. Right now I am at the snow in Victoria. It doesn't snow much in Australia, especialy not in the good old South Australia. Super Toby does not like the cold, and thus chose not to come on this trip. The comics will still be uploaded daily. Watch out in a few days for the two-part 100th strip special. It will be a "hoot". Well, I have run out of content to write about. So, enjoy a turtle pic. Welcome Loyal Fans and/or Internet Weirdos! Well actually welcome to my first blog ever. Yayyyy! If you are reading this you are awesome. As some of you might of noticed, Super Toby had a really long "short break". As some of you might also know, Australia has terrible internet. After ADSL was cut off where I live, my house was plunged in to eternal darkness, a shadow cast by a lack of internet. Recently, I have acquired the “blessing” of the NBN, allowing me to upload again. Well, enough excuses. 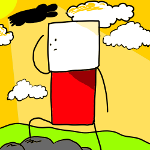 Super Toby will be uploading once a day again, at least until he needs another break (isn’t this comic so reliable?). Super Toby has given me an excuse too, supposedly he couldn’t be bothered telling me about his escapades. The “Super” in Super Toby obviously comes from “Super Lazy”. Well, that's all for now.